Another week, another hackathon, this time in Waltham Forest which will be the first London Borough of Culture in 2019. The hackathon is the last event in Waltham Forest Council’s Digital Month. dxw digital joined a group of local developers and designers to work on the first Map of Culture, mapping the borough’s cultural hotspots. 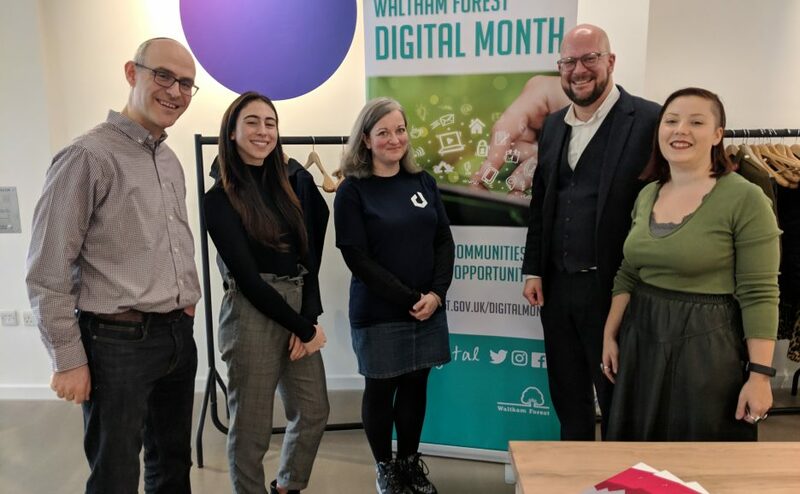 Theo Blackwell, London’s Chief Digital Officer (CDO), stopped by and met the team, pictured here with Waltham Forest Director of Digital Paul Neville alongside Regan, Laura and Agz from dxw. London’s first CDO, Theo has long advocated using open data to help solve wider problems. While the day was all about creating the Culture Map, the underlying API and technology could be reused for other services. What did we work on? The dxw team implemented a front-end framework for quicker styling to enable faster prototyping in HTML templates for making future improvements to the map. This will make it easier to work on the map in future. We also looked at existing designs and created a set of user stories to understand the user journey. They broke the tasks down into smaller cards in Trello, so back-end developers can start building the functionality for adding locations to the map. All the work is here on Github. You can also find out more about the London Borough of Culture and Waltham Forest Digital Month.